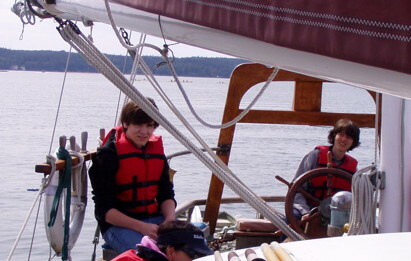 When S.V.CUTTY SARK is not sailing in the San Juan Islands, she is available for "day sails," May -September from the port of Coupeville; and from the Oak Harbor Marina, October-April. Day sails are at the rate of $101.20 per hour + tax (2-hour min. ), $600.00 + tax for up to a 10-hour day if returning to tour origin, $650.00 per day if an overnight away is involved. These rates are for up to six passengers and include the ship, captain and fuel. Any other expenses i.e. ; incidentals, beverages, food, lodging, taxes, etc. are the responsibility of the chartering party. Call us at 360-678-5567. Or e-mail captjohn@svcuttysark.com. We look forward to setting sail with you. All proceeds go to the educational non-profit Aeolian Adventures, Inc., a 501(c)(3) organization. Donations are tax deductible where the law allows. More about Captain John Colby Stone and the Cutty Sark (in an Acrobat pdf).